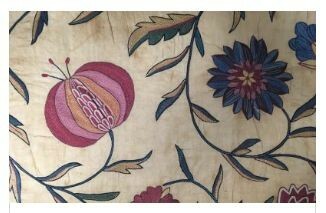 Chapel Arts are delighted to announce that Jennifer Wearden from the V&A will give a series of study days on the history of textiles entitled: ‘Four Fibres: Many Stories’. A history of textiles can be told by looking at the four major natural fibres used in their construction: wool, linen, silk and cotton. Their story touches on ancient Egyptian burial rites, medieval church vestments, early aeronautics, the fashions set by the wealthiest elite and the effect of the American Civil War on the textile industries of Iran. This series of talks will include silks and velvets, knitted wool, printed cotton, the finest lace and immense tapestries and carpets. It will explore the most intimate of the decorative arts. We wear textiles, we furnish our homes with them, but how much do we really know about their history? The course comprises of six days, each containing two talks, 11.30am – 12.30pm and 1.30pm-2.30pm.